Currency Museum of the Bank of Japan 2-min. walk from Mitsukoshi-mae Sta. on Ginza Line & Hanzomon Line or 10-min. 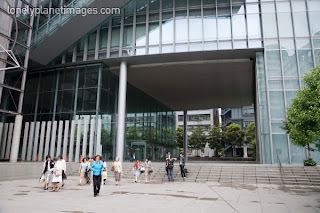 walk from Tokyo Sta., was opened in 1985 by Bank of Japan. It contains about 4,000 representative currency items and exhibits a history of currency. Open: 9:30-16:30 (enter by 16:00) Closed: Mon., national holiday (when Sat. & Sun. fall on a national holiday, it's open.) and New Year’s holiday. 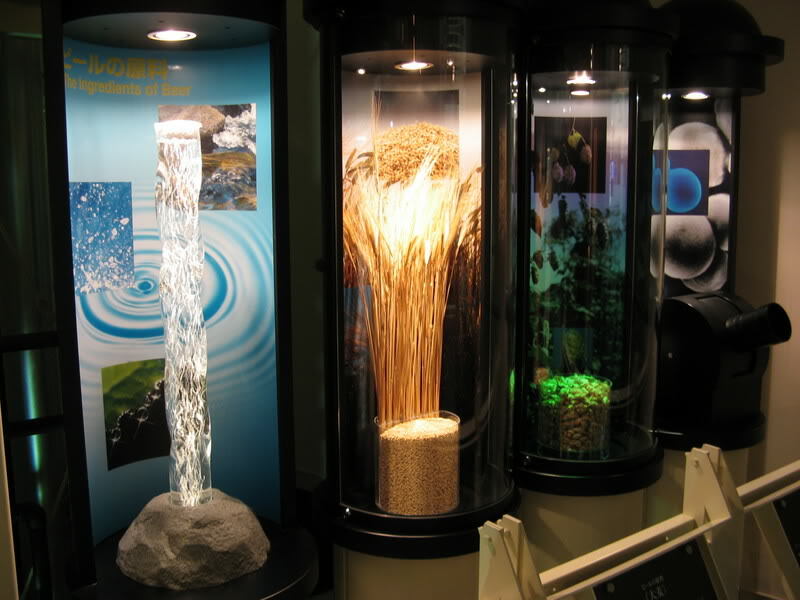 Currency Museum is the facility for viewing the exhibits with historical value. The Museum may ask following persons or visitors not to enter the Museum. Thank you for your corporation and understanding . 1. Those who visits the Museum for purposes other than viewing our exhibits. 3. Those who may make a nuisance to the other visitors such as heavily drunken person. 4. 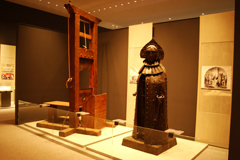 Those who regarded inappropriate to view our exhibits judged by the Museum. 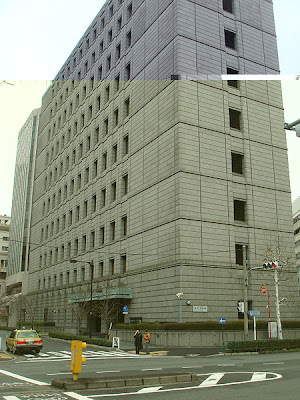 Since its foundation, the Bank of Japan has collected both domestic and foreign notes and coins for research purposes. At the heart of the Museum’s collection is the Sempeikan Collection acquired from renowned numismatist Keibun Tanaka at the close of the Second World War. 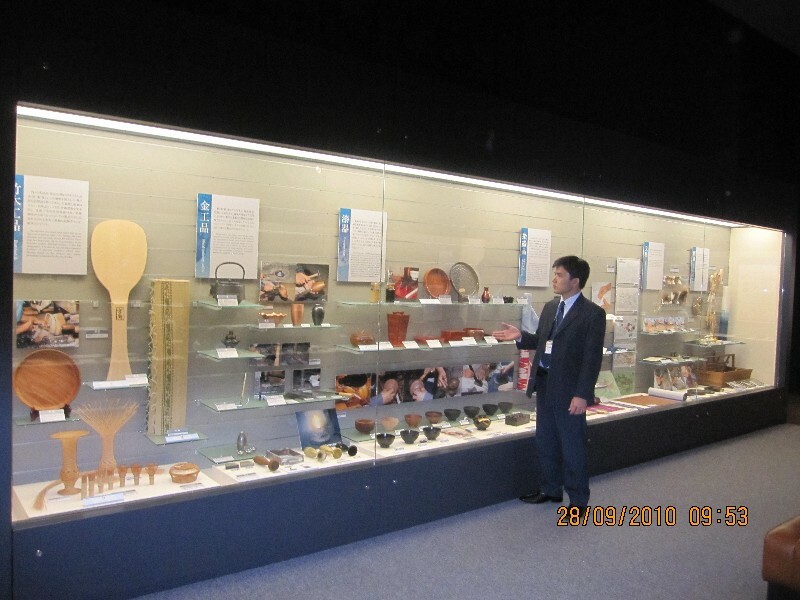 The Bank’s collection has continued to expand, and is one of the largest in Japan. The collection is world famous not only for the variety of currency items from Japan but also from other East Asian countries. by 22:30), Closed: 2nd and 4th Mondays (open when Monday falls on a national holiday and closed the following day. ), Dec. 29-31 & Jan. 2-3. [South observatory] Open: 9:30-17:30 (enter by 17:00), Closed: 1st and 3rd Tuesdays (open when Tuesday falls on a national holiday and closed the following day. ), Dec. 29-31 & Jan. The building consists of a complex of three structures each taking up a city block. 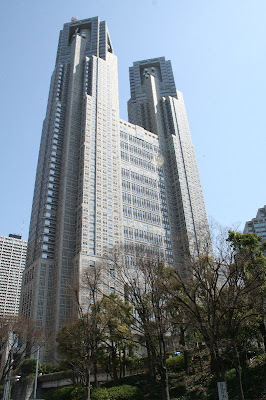 The tallest and most prominent of the three is Tokyo Metropolitan Main building No.1, a tower 45 stories tall that splits into two sections at the 33rd floor. The building also has three levels below ground. 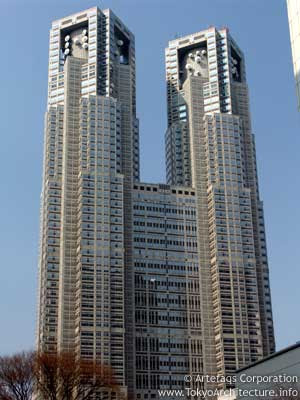 The design of the building (which was supposed to looks like a computer chip), by architect Kenzo Tange (and associates), has many symbolic touches, most notably the aforementioned split which re-creates the look of a Gothic cathedral. Located in Nishi-Shinjuku, it is the tallest building in Tokyo at 248 meters (814 feet) from base to top, and the second-tallest structure after Tokyo Tower. The two top-floor observation decks are free of charge to the public. It is only a short walk from Shinjuku Station. Given that it is free to use the observation decks and has fewer tall buildings built around, the Tokyo Metropolitan Government Building is the best observation deck in Tokyo to use. 10:00-16:30 (enter by 16:00), Tel: 03-3296-4448. All museums are closed on summer holiday, New Year's holiday and Meiji University holidays. The Museum is divided into three departments, each having a distinct origin. The Commodity Department, the successor to the "Commodities Museum" considers lifestyles through commodities; and the Criminal Materials Department, follows in the footsteps of its predecessor the "Museum of Criminology" and contemplates law and human rights. The Archaeology Department, formerly the Archaeological Museum. Archaeology is the study of looking at humankind's past and recreating the transitions of lifestyle and culture. It is for this reason that archaeologists dig for relics and collect materials to restore the past. 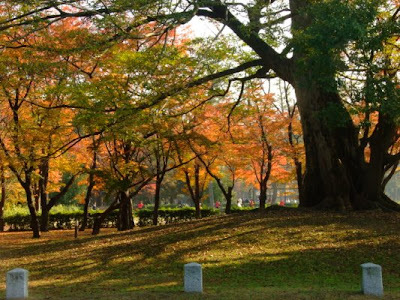 Since the inauguration of the Archaeology major in the School of Arts and Letters, Meiji University has conducted research and surveys on relics from the Paleolithic era to the Kofun (tumulus) period. As part of these efforts, at present there are exhibits from archaeological finds of four designated important cultural assets from the Iwajuku site in Gunma Prefecture, the Sunagawa site in Saitama Prefecture, Natsujima shell mounds in Kanagawa Prefecture and the Izuruhara site in Tochigi Prefecture. Meguro Parasitological Museum15-min. walk from Meguro Sta. on JR, Mita and Nanboku Line, or 3-min. walk from Otori-Jinja Bus Stop by Tokyu Bus from Meguro, is the only museum in the world on parasites. It exhibits various specimens, studies and photos of parasites. Open: 10:00-17:00. Closed: Mon. (the following day when Mon. falls on a national holiday) and New Year’s holiday. 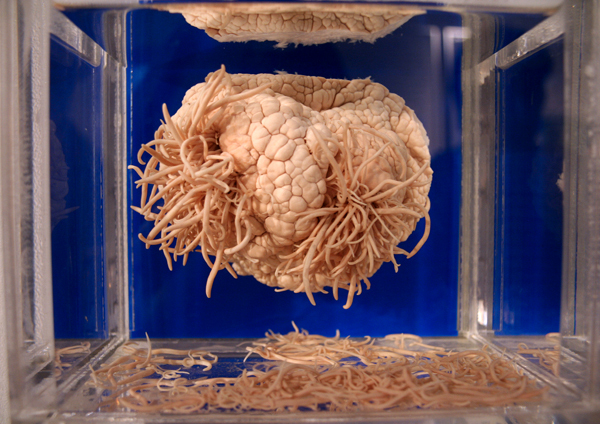 The Meguro Parasitological Museum is a research facility that was established in 1953 by the private funds of Satoru Kamegai (1909-2002), a Doctor of Medical Science. Since its establishment, the Museum has achieved substantial success owing to the help of volunteers in the private sector as well as the assistance of the government, in addition to the support of the academic establishment. The parasite-related materials and specimens held by the museum along with the museum's research and publication activities allow the museum to pride itself as one of the most distinguished museums in the world. The first floor of the museum presents a general overview of parasites while the second floor focuses on the parasite life cycle, showcasing 300 actual specimens. 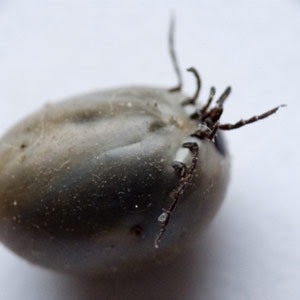 Because parasites utilize other animals for their survival, it is difficult to artificially sustain them and we cannot actually show them living. Mon. (the following day when Mon. The Beer Museum Yebisu is dedicated to the history, science and culture of the beloved beverage and the century-old tradition of brewing beer. Beer making made its debut in Japan as early as 1876 when Seibei Nakagawa, who had recently returned from Germany where he studied the art of beer making, was chosen as brewmaster and oversaw the construction of a beer factory in Hokkaido, Japan. In 1887, Nippon beer was formed and by 1890 they had created the Yebisu brew. 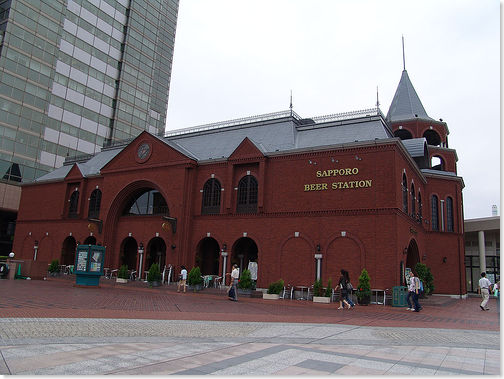 Actually, the current name for the area and station, Ebisu, comes from the beer's name. Walk from JR Ryogoku Sta 5-min, provides you with the history, many documents, paintings (Japanese woodblock prints (Ukiyoe)), photos and videos of fireworks. Open: Thu., Fri. and Sat., (daily during Jul.-Aug.). 12:00-16:00. Another main event in Ryogoku is Edo-Tokyo Museum. This appearance is the image of old warehouse. The hight is 62m, which is the hight of former donjon (castle keep) of Edo Castle. It was built in 1984 mainly for Sumo, but it is also used for other sports and as a concert hall. It can hold about 11,000 audiences. Sumo tournament which lasts 15 days is held 6 times a year and 3 of them are held here in Ryogoku Kokugikan, in January, May and September. The tickets cost from 2,100 yen to 14,300 yen. If you buy the 1st floor ticket, there is no chair. You have to sit on the cushion, but the ring is near and it will be very impressive. 1-min. walk from JR Ryogoku Sta., or 5-min. walk from Ryogoku Sta. on Oedo Line, is the official museum of the Sumo Association. It houses more than 20,000 historical and memorial items of Sumo wrestling, such as paintings, books, photos and the like. Open: 10:00-16:30. Closed: Sat., Sun., national holidays & New Year’s holiday. Kyoto Imperial Palace Stroll garden designed by Kobori Enshu (1579-1647). Located almost in the center of the city, this huge park-like compound includes several palace buildings. It was also the location of many fine residences belonging to the ranking noble court families. These residences were torn down and a massive park, with lawns and over 9,000 trees, was created. Today, this extensive park area is a highly popular recreation and relaxation zone. Addr. : Kyoto Gyoen-nai, Kamigyo-ku, Kyoto. 10-min. walk from Marutamachi Sta. Kyoto is an ancient city with a 1200 year history. It was established as Japan's capital under the name "Heian-kyo" in the year 794. Since then, Kyoto has preserved the beloved properties of its culture as testimonials of time. This is shown in a lot of ancient temples (e.g. Kiyomizudera, Kinkakuji) and shrines (e.g. Heian-jingu) built in styles unique to Kyoto. These properties as well as many festivals, ceremonies and traditional industries, attract people all over the world today. Kyoto is often called "Japan's heartland", and it is said that it is impossible to know the real Japan without knowing Kyoto. Kyoto's has an inadequately developed public transportation system, consisting of two subway lines (Karasuma line and Touzai line), a dense bus network and as many as half a dozen railway companies. Those railways (except subways) and buses, however, are almost irrelevant to tourists, although not completely. Taxis can be a worthwhile alternative. 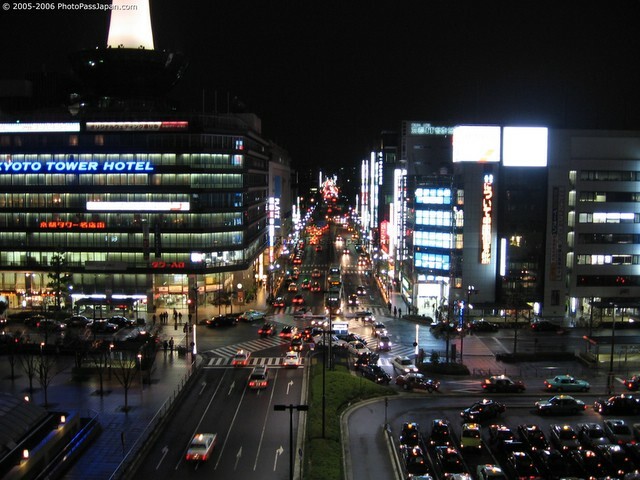 Kyoto's city center with the highest concentration of dining, shopping and entertainment opportunities, is located around the junction of Shijo-dori (4th Avenue) and Kawaramachi-dori (Kawaramachi Street). JR Kyoto Station is located south of the city center at the height of Hachijo-dori (8th Avenue). 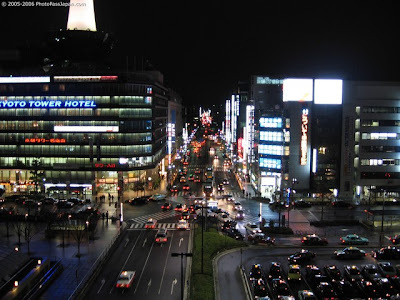 The most prominent north-south street is Karasuma-dori (Karasuma Street), which runs from Kyoto Station via the city center to Kyoto Imperial Palace. Gion is Kyoto's most famous geisha district. Stroll along Hanami-koji, a street lined by beautiful old buildings, teahouses and restaurants and you may be able to spot a geisha apprentice in the evening. Pontocho is another traditional nightlife districts. It is a narrow street running from Shijo-dori to Sanjo-dori, one block west of the Kamo River. In the evenings, the narrow street offers a great atmosphere and lots of restaurants and teahouses, ranging from inexpensive yakitori stores to highly exclusive establishments which require the right connections and expenses. Kyoto has a rich history which has made it the cultural center of Japan. There is no way to experience all the city has to offer in our short stay, however, there are some general things that you should consider doing. 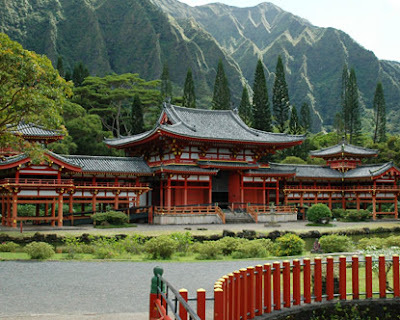 Temples and Shrines: Kyoto has about 1600 Buddhist temples and 400 Shinto Shrines. 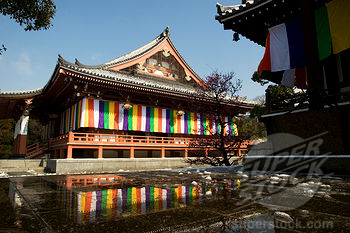 Seventeen have been declared UNESCO World Heritage Sites, including Nanzen-ji temple. 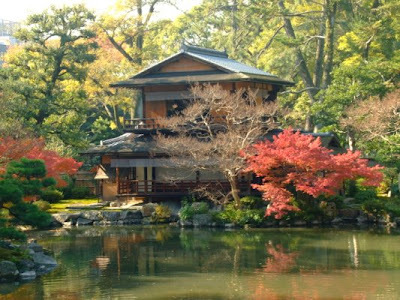 It is known as one of Kyoto’s most pleasant temples with expansive grounds and many subtemples. It was built in 1291 and is the headquarters of the Nanzenji sub-sect of the Rinzai sect of Buddhism. Experiencing Traditional Culture: Kyoto has many tourist attractions that will allow you to experience the traditional culture of the city. These include the Gion (Geisha) district, tea houses, and even Maiko make-over studios. The city is also known for its traditional arts and crafts, which can be seen in stores and markets city-wide. For an interesting experience, you can also visit companies that brew sake. One example is Ama no Kura, which was founded in 1832. They let you taste their famous sake as well as try your hand at brewing your own. 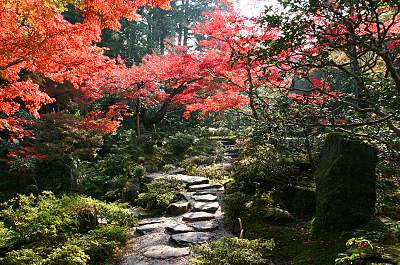 Natural Environment: Many of Kyoto’s attractions display the city’s natural beauty. Some of the most visited include Amanohashidate (a sandbar in Miyazu Bay that is said to be the fallen ladder used by a mythical god to climb to heaven), the Path of Philosophy (where professors from Kyoto University walk among the cherry trees and shops in meditation), and Kyoto Imperial Palace Park (located near the center of the city, it is known as an urban oasis for birds). 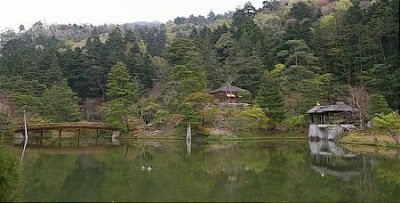 Relaxing: Kyoto is also known for its bath houses and hot spring resorts. Two well known ones include Funaoka Onsen (a bathhouse in the city with museum quality wood carvings in the changing rooms) and Kurama Honmachi (a hot springs resort within easy reach of the city with indoor and outdoor bathes). Kyoto REGIONAL FARE/FOOD Kyoto is known for its rich and varied culinary scene, and is known for having some of the best food in Japan. In part this is due to Kyoto’s imperial and artistic history. Katsura Imperial Villa A typical stroll garden laid out in the 17th century. This garden is renowned as an outstanding example of Japanese landscape gardening. Addr. : Misono, Katsura Saikyo-ku, Kyoto. 20-min. walk from Katsura Sta. on Hankyu Dentetsu Line; or reached from Katsura-Rikyu-mae Bus Stop. Guided tours (in Japanese) are available. 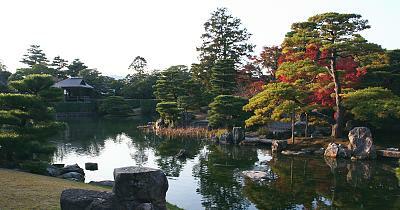 Free tours of Katsura Imperial Villa are held several times daily in Japanese only. No tours are held on Sundays and national holidays. Most Saturdays are also unavailable. Check with the agency for an up to date schedule. The Katsura district of Kyoto has long been favored for villas, and in the Heian period, Fujiwara no Michinaga had a villa there. The members of the Heian court found it an elegant location for viewing the moon. Prince Hachijō Toshihito (1579–1629), the first of the Hachijō-no-miya line, established the villa at Katsura. The prince was a descendant of Emperor Ogimachi, and younger brother of Emperor Go-Yozei. Once adopted by Toyotomi Hideyoshi, he cancelled the adoption when Hideyoshi had a son, and founded the Hachijō-no-miya house. The Hachijō-no-miya house changed its name to Tokiwai-no-miya, Kyōgoku-no-miya, and finally Katsura-no-miya, before the line died out in 1881. The Imperial Household Ministry took control of the Katsura Detached Palace in 1883, and since World War II, the Imperial Household Agency has been in control. The shoin of Katsura Imperial Villa is divided into three parts: the Old Shoin, the Middle Shoin, and the New Palace. The Old Shoin was built in around 1615 A.D. The construction of the shoin, teahouse and garden continued in the time of the second prince, Toshitada (1619–1662), and reached completion after some decades. Sentō Imperial Palace Stroll garden designed by Kobori Enshu. Addr. : Kyoto Gyoen-nai, Kamigyo-ku, Kyoto, (in the Kyoto Old Imperial Palace compound). Near Marutamachi Subway Sta. Guided tours (in Japanese) are available. The garden's primary feature is a large pond with islands and walkways, whose north and south segments were linked by a short canal in 1747. The north pond was extended and reworked from 1684-1688; the south pond is notable for its expansive "ocean shore" of rounded stones and cherry trees, an edging of mixed natural and hewn stones, and a separate, understated embankment of squared stones. The ponds contain a variety of highly picturesque islands and six bridges in a varied styles, including one with an impressive wisteria trellis (built 1895). Sento Imperial Palace was completed in 1630 for Emperor Go-Mizunoo's retirement, along with the corresponding Ōmiya Palace for the Empress Dowager Nyoin. Both palaces were repeatedly destroyed by fire and reconstructed until a blaze in 1854, after which the Sento palace was never rebuilt. (Ōmiya Palace was, however, reconstructed in 1867 and is still used by the emperor whenever he visits Kyoto). Today only two Sento structures, the Seika-tei and Yushin-tei teahouses, remain. 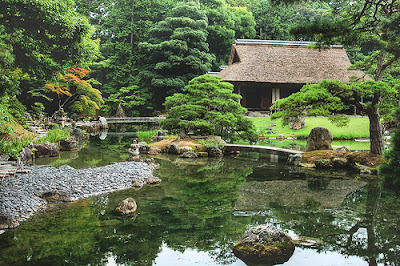 The excellent gardens, laid out in 1630 by renowned artist Kobori Masakazu (Kobori Enshu), are now its main attractions. The Shugakuin is only accessible to the public through guided tour must be booked in advance and lasts about one hour and twenty minutes. It takes visitors through all three villas, and points out the significant garden features and structures. The tour is only offered in Japanese, however, an English audio guide is available. The Shugaku-in was originally constructed by the retired Emperor Go-Mizunoo, starting in 1655, with the initial construction completed in 1659. The site had been previously occupied by the Enshō-ji nunnery, founded by his oldest daughter, Princess Ume-no-miya; it was moved to Nara to make room for Go-Mizunoo's creation. The Upper Garden contained a large artificial pond, created by building an earthen dam across a ravine; the pond contains a number of small islands. 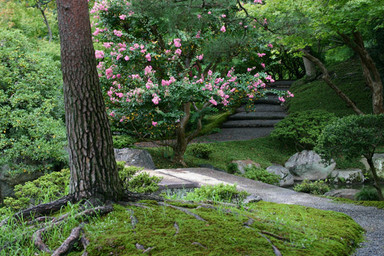 Unlike the typical Japanese garden, it is a very large stroll garden, making extensive use of the technique of "borrowed scenery". The Lower Garden was originally much more informal than what is now there; originally it was more of a simple arrival station for visiting guests. 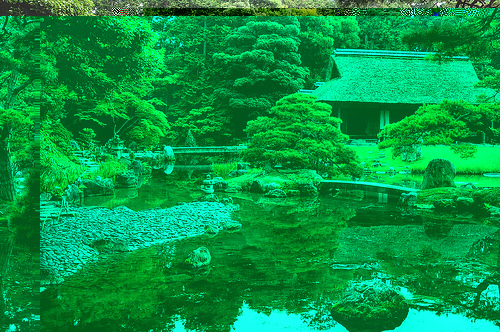 After Go-Mizunoo's death, his daughter Princess Mitsuko became a nun, and established another temple there, the Ryinku-ji, in what later became the Middle Garden. The gardens and buildings then fell into disrepair, with some of the buildings either being destroyed, or removed. During the rule of Tokugawa Ienari, the 11th Tokugawa shogun, the Shūgaku-in was thoroughly renovated. unification of nature and garden. Addr. : Shugakuin, Sakyo-ku, Kyoto. 15min. walk from Shugakuin-Rikyu-michi Bus Stop or Shugakuin Sta. on Eizan Dentetsu Line. Guided tours (in Japanese) are available. Byodoin Temple Originally a pond garden for boating laid out in the 11th century. The construction of the temple and its garden was intended to recreate the Buddhist paradise in this world. Addr. : 116, Renge, Uji, Kyoto. 40 min. by train from Keihan-Sanjo to Uji on Keihan-Uji Line, or 30 min. by train from Kyoto Sta. to Uji Sta. on JR Nara Line. The beautiful grounds include a two-acre reflecting lake, peacocks, swans, ducks, meditation niches, and little waterfalls. The mountains in the background and the lush gardens complete the scene. Chishakuin TempleChishakuin Temple Is beautiful Landscape garden for viewing from within a building, designed by Sen-no-Rikyu (1522-1591), the great ceremonial tea master of the Momoyama Period. The garden retains a vestige of its former glory. Addr. : Higashiyama Shichijo, Higashiyama-ku, Kyoto. Near Higashiyama Shichijo Bus Stop. From its earliest days until the dawn of the twentieth century, travel in Japan revolved around religion and religious affairs. Scholar Shuzo Ishimori (1995) argues that ‘pleasure’ travel in Japan originated in the late seventh century when Empress Jito made more than 30 trips to the Imperial Family's resort villa in Yoshino, as well as trips to hot springs such as Arima in the hinterland beyond Kobe. When Buddhism established itself in Japan in the seventh and eight centuries religion provided both the objective and the means of travel. By the tenth century, both temples and Shinto shrines were making travel arrangements for their sect members to visit their sanctuaries (Graburn, 1983). The Heian period (794-1185) saw travel to Mount Koya and Kumano Shrine. A round trip between the capital Kyoto and Kumano Shrine took about a month, covered 600 kilometres, and involved a group of 1000 people including guards and porters. Yet until the Azuchi-Motoyama Period (1568-1602) it was extremely difficult to travel vast distances due to the poor quality of the roads and the sekisho system. This was a series of checkpoints (on land and sea) that required travellers to pay clearance fees. At the time, a trader taking his boat from Kyoto to Osaka along the Yodogawa River had to clear 660 checkpoints, or one approximately every 100 meters (Ishimori, 1989). The dawn of the Tokugawa Period (1603-1867) brought revolutionary changes to Japanese society. The nature and means of travel would change forever. Tokugawa Ieyasu's victory at the Battle of Sekigahara in 1600 brought an end to years of warfare and ushered in an unbroken period of peace, maintained by an authoritarian military regime based in Edo (Tokyo). The Tokugawa authorities instituted a number of major policies that would have a profound impact on society and, by extension, travel. Religion was, as explained earlier, the motivating force and rationale underlying most Japanese travel from ancient times until the late nineteenth century. The main form of religious travel was the pilgrimage. 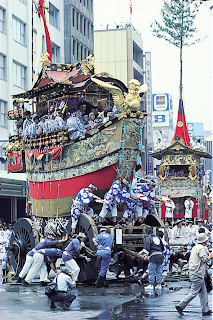 They comprised three types: 1) honzon (specific gods or Buddhist images) junrei (pilgrimage), a pilgrimage for solely religious purposes, 2) soshi junrei, a pilgrimage to visit temples founded or occupied by particular sect in order to worship founders (soshi), such as the eighty-eight sacred places on Shikoku, and 3) meiseki junrei, a pilgrimage to visit famous places (meiseki), such as the seven big temples of Nara or the twenty-one temples of the Nichiren sect. The third type had mass appeal due to its more secular, tourism-like elements. The most famous and grandest pilgrimage was the okage-mairi, a term used to describe large-scale pilgrimages to the Grand Shrines of Ise. Supposedly only to be held every sixty-one years, many pilgrimages were held in intervening years. 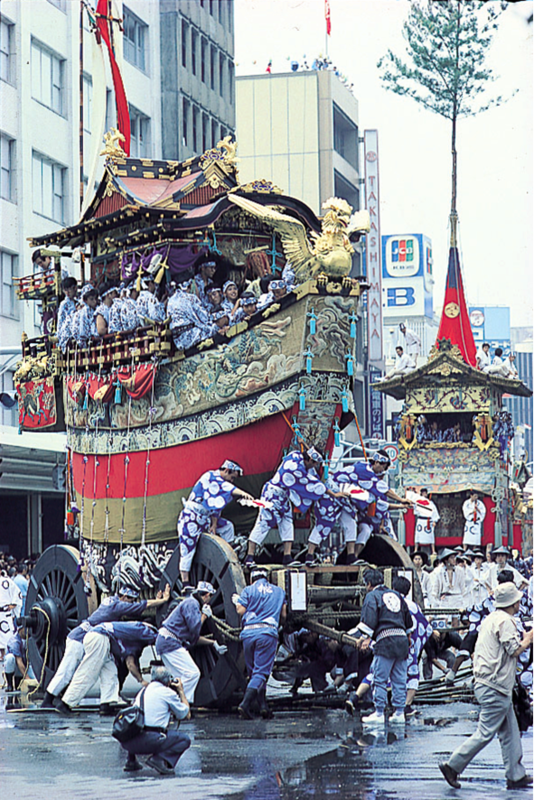 In the spring of 1705, the year of the first mass pilgrimage, children in the Osaka, Kyoto and Sakai area aged between seven and fifteen left their homes and set out for Ise; thirty-three thousand travellers from Edo journeying reportedly passed through the Hakone post station on a single day (Vaporis, 1994). Along the way as many was 3.62 million people joined the caravan. In annual surveys of Japanese preferred leisure activities, domestic tourism consistently comes out as most preferred (Reja Hakusho, 2001). Indeed, much of Japan's culture and many of its customs require travel, of which sightseeing is often a major component. For example, the two main holiday seasons - Oshogatsu (New Year) and Obon (mid-summer) - both involve, by tradition, return to one's birthplace or parent's home. Second, public holidays in the traditional Japanese calendar were festivals held to commemorate major transition points in the agricultural or natural cycle. Third, travel is also institutionalised within an organisation. To cite two examples, there is the annual holiday taken by company colleagues (shokuba ryokô), and the school excursion (shûgaku ryokô), undertaken by all junior and senior high-school students. 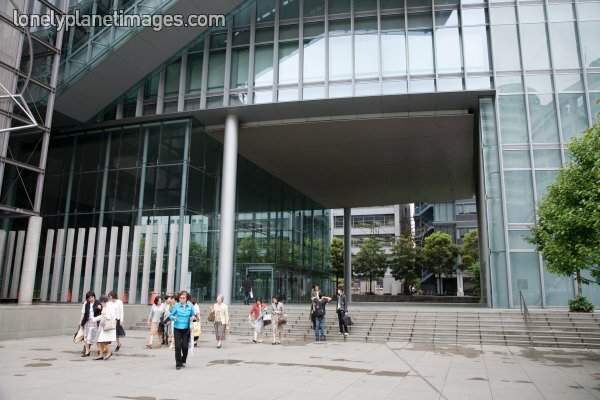 It is also tradition for university or college students to undertake a sotsugyô ryokô (graduation holiday), after graduating and before entering a company. Fourth, trips to natural hot springs (onsen) have been popular for all Japanese since the middle ages. Renowned for their healing properties, the soothing waters of Japan's onsen continue to attract hundreds of thousands of Japanese each year. One of the most fascinating aspects of Japanese travel is the powerful socio-psychological bond that exists between the traveller and those left at home. Graburn (1983) goes as far to call this the most important aspect of social organisation that "differentiates Japanese travel from that in the West" . (The Japanese preference for travelling in groups has been well documented (see, for example, Embree 1967 and Nakane 1970). The expression 'tabi wa michizure' (travel calls for a companion), for example, dates back to Tokugawa. When Japanese set out on a journey, therefore, they leave behind members of the different groups to which he or she belongs (except in the case of an entire school class, perhaps). While this true is for travellers from any culture, it has special significance for Japan, where a number of customs emerged over time that served to reinforce the myriad set of personal relationships developed by a Japanese individual.